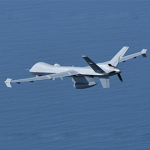 India intends to buy General Atomics-built unmanned aerial systems designed for maritime surveillance operations through an estimated $2 billion government-to-government deal with the U.S., Business Standard reported Thursday. The report said India will order 22 units of unarmed Sea Guardian UAS, a naval version of the Predator B platform. U.S. and Indian governments said in a joint statement released in June the sale of Sea Guardians would help bolster the latter country’s maritime domain capacities and expand bilateral maritime security cooperation. India previously ordered $5 billion worth of weapons from the U.S. that include Boeing-built P-8I Poseidon maritime aircraft, C-17 Globemaster III transport aircraft, AH-64E Apache attack helicopters, CH-47F Chinook multimission helicopters and M-777 howitzers.